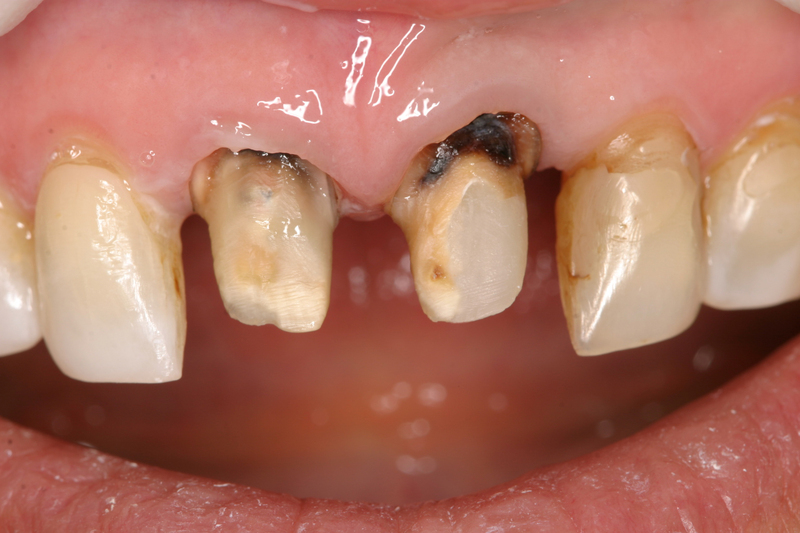 This patient had two failing crowns on her front teeth. The old crowns and decay was removed. 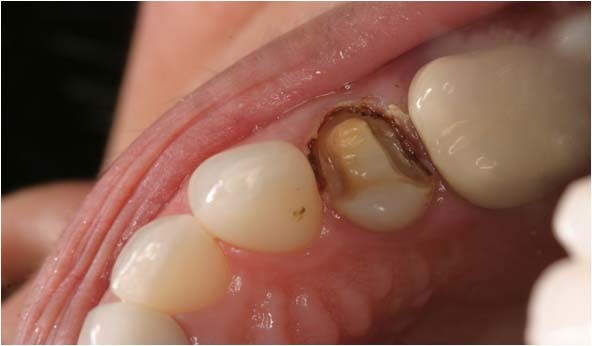 The dark color is from the tooth changing color as a result of an old root canal. 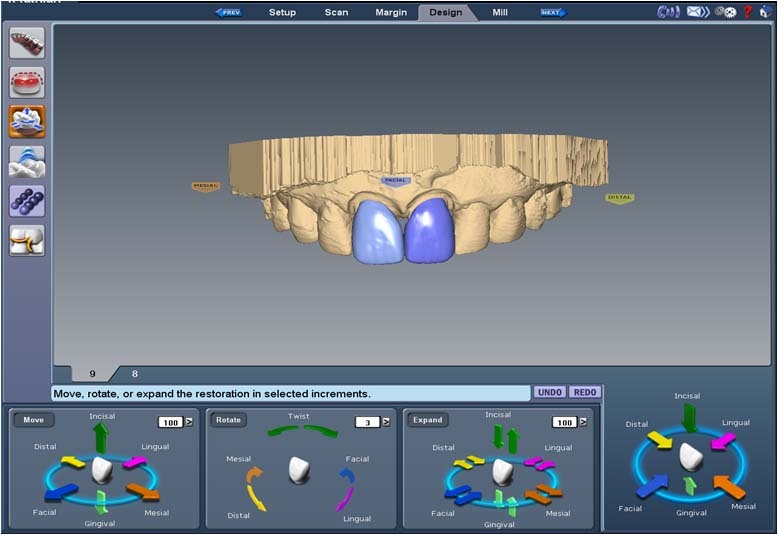 The computer generates two ideal matching crowns. 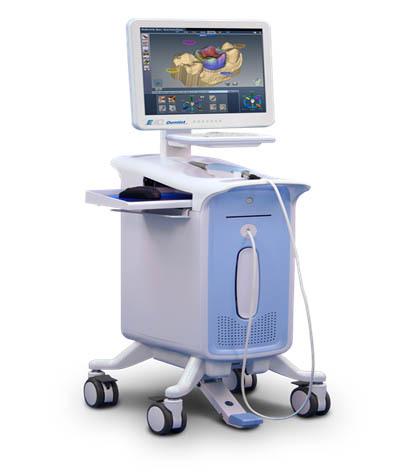 We can then adjust size, shape, and color if necessary. The final crowns are milled out of blocks of poreclain. 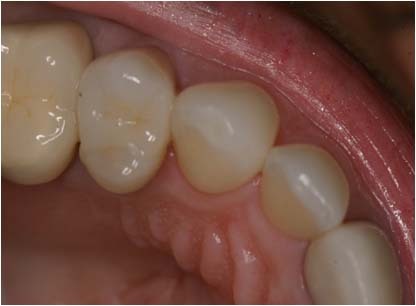 The final cemented restorations, completed the same day! 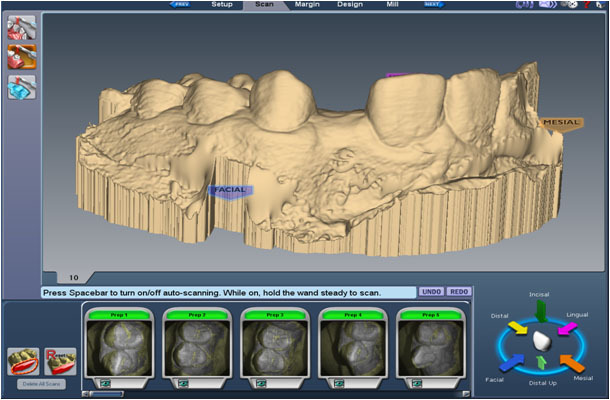 After removed the old crowns and cleaning decay, a digital impression was taken using the E4D scanner. 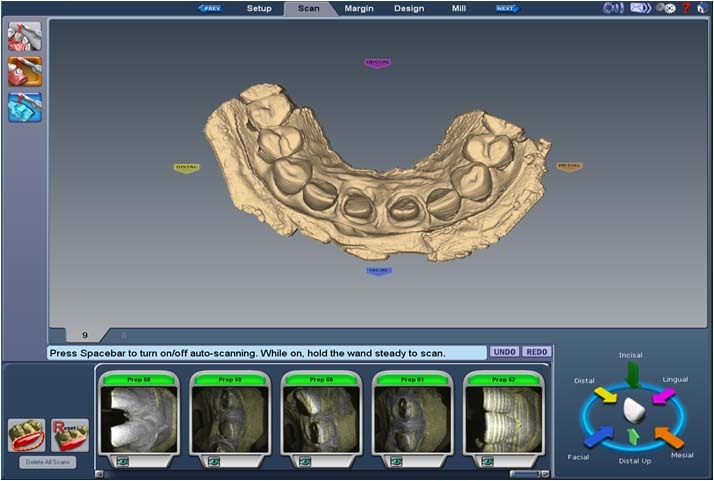 The scanner takes photos from different angles to create a 3-D image of the teeth. 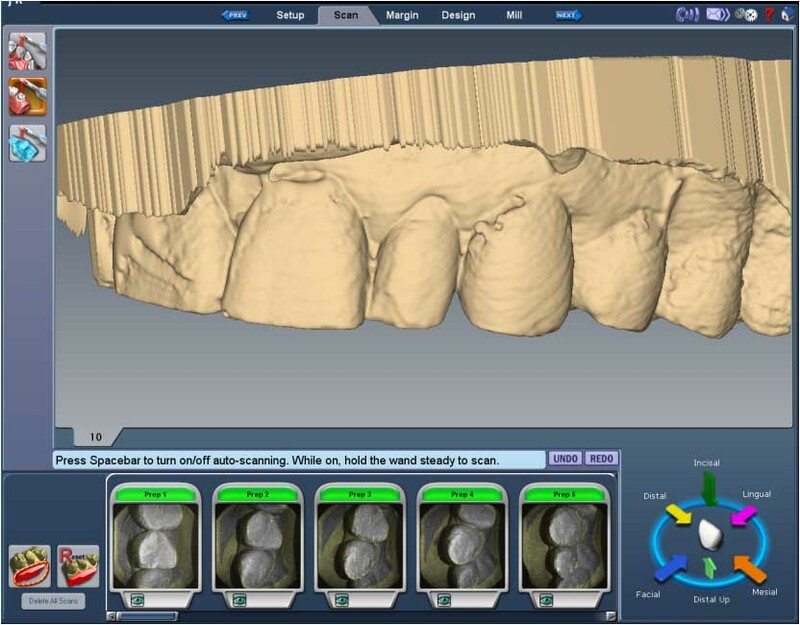 The software then designs the new crown for the best possible esthetics and function. Here are the new crowns, about and 1.5 hours later. Her lateral incisors was rotated inward. 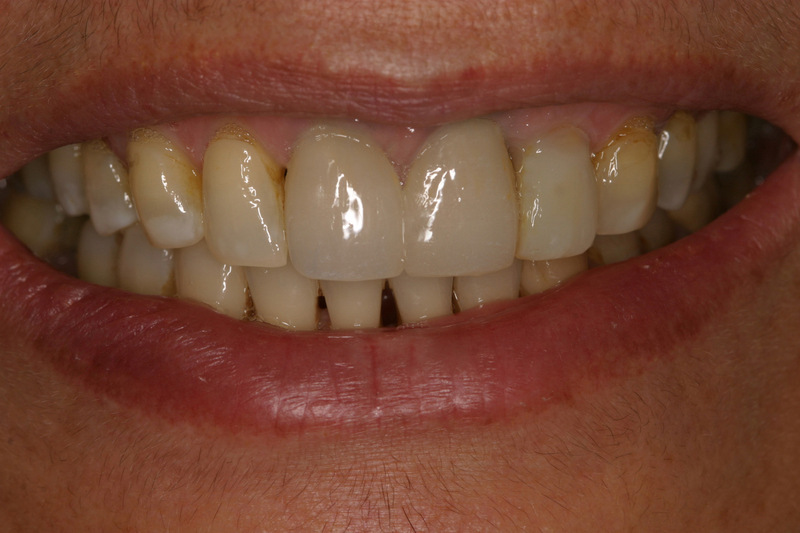 To correct this we decided to place a veneer using the E4D system. 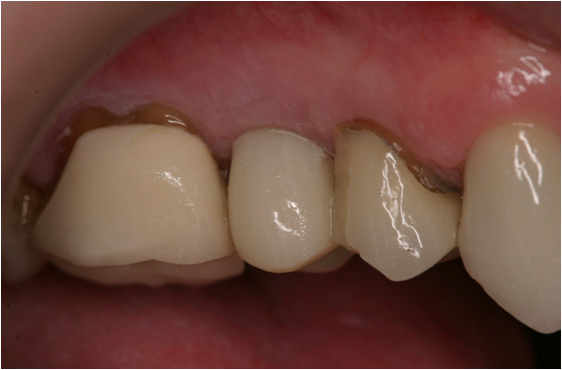 Since the E4D system is can fabricate thin veneers, no reduction of tooth structure was done. 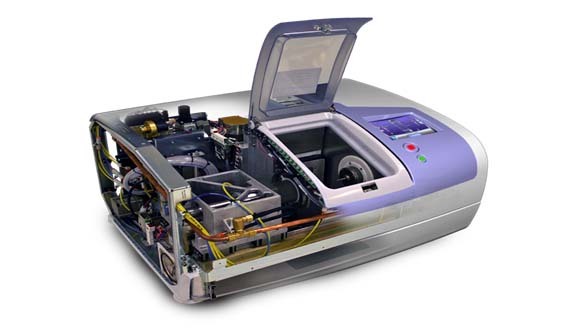 Her teeth were scanned into the systems. A veneer was designed to match the adjacent teeth. 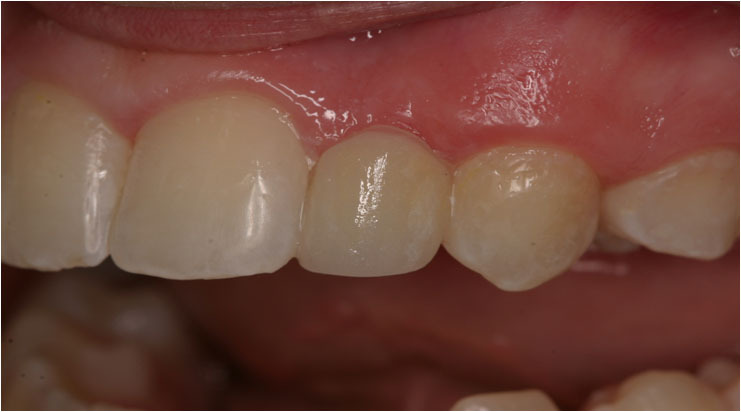 The final restoration completed with reduction of any tooth structure. 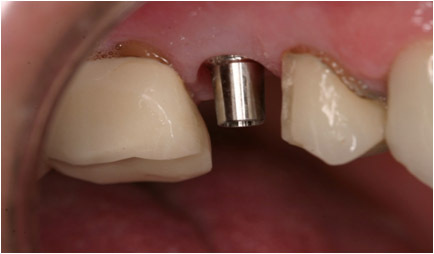 This patient's implant was ready to have a crown placed on it. 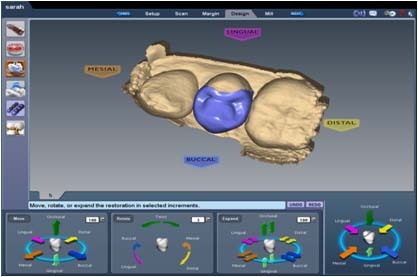 A abutment connector was attached to the implant. 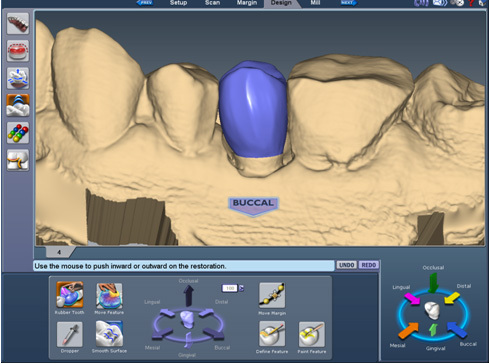 The abutment creates the shape of a tooth that has been prepared for a crown. 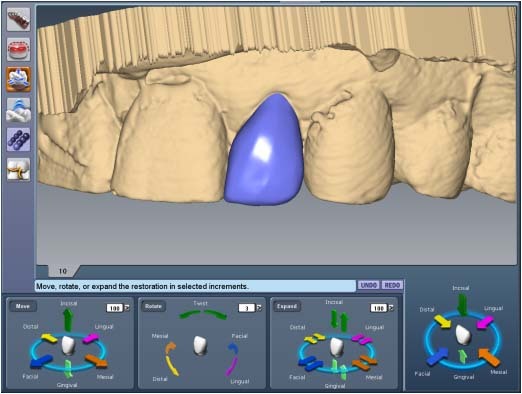 The implant abutment and adjacent teeth are scanned into the E4D system. 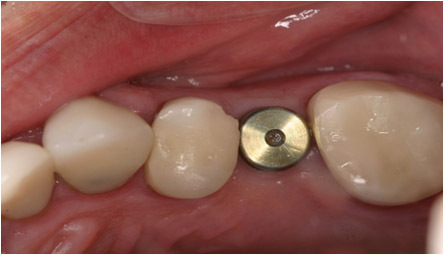 A percision fitted crown is designed to give the ideal esthetics and function. 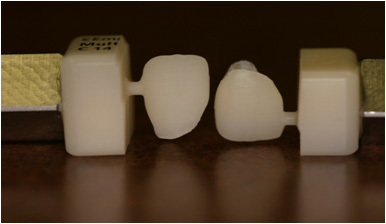 The crown is then milled out of a high strenght ceramic. 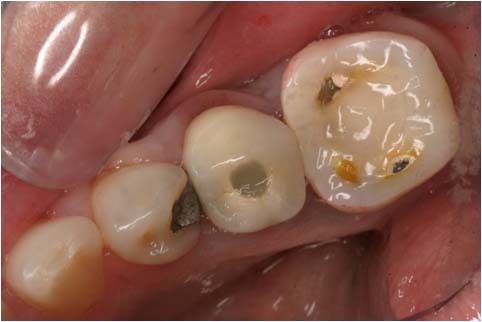 The crown (the natural looking tooth in the middle) is cemented over the implant abutment. 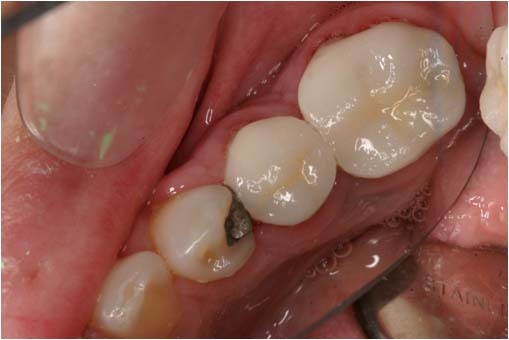 This patient was too young for an implant. 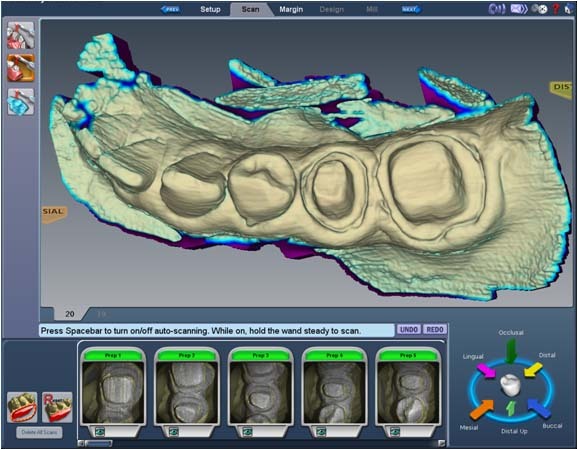 As a long term temporary we decided to attach a bonded bridge to the inside of the teeth. 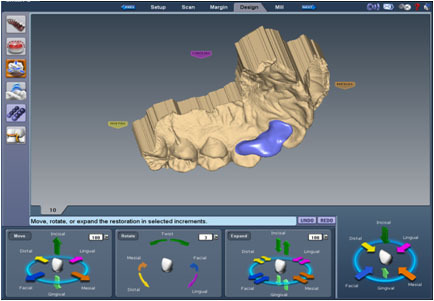 The bridge is designed to attach to inside of the teeth while not altering the patients bite. The final bridge. 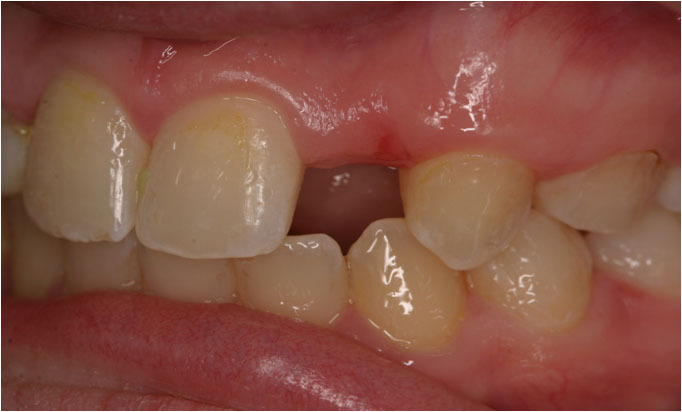 The restoration was fabricated in about 1 hour without the reduction of tooth structure. An onlay is a conservative crown. 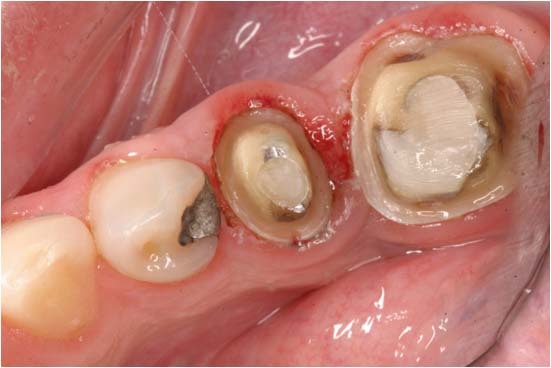 In this case the patient had fractured off the outside of the tooth. The middle area has a filling. 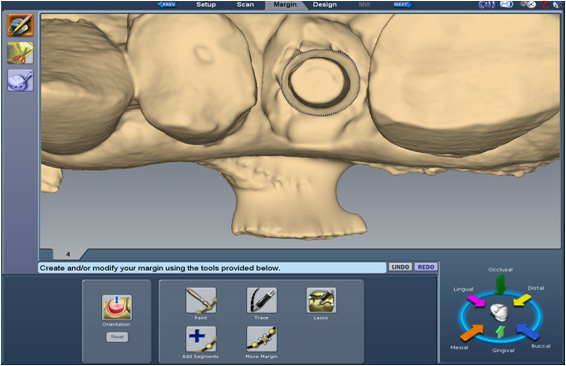 The inside area still has healthy tooth structure. 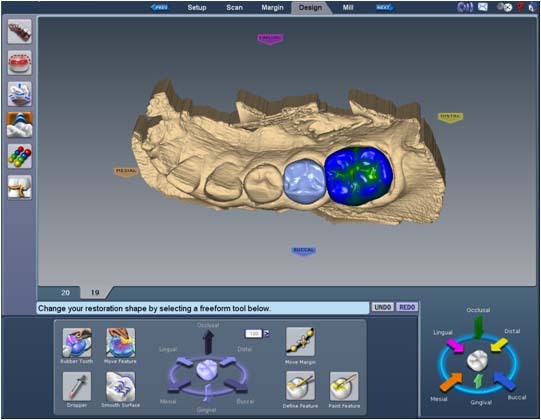 The E4D system designed and mills a restoration to replace the missing tooth structure. The Final restoration cemented in about 45 minutes later.